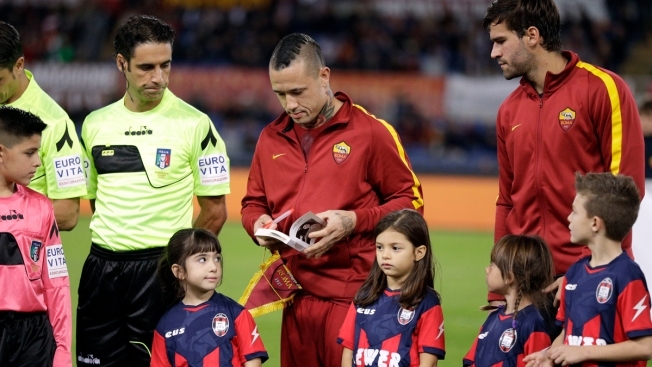 Roma's Radia Nainggolan presents a copy of Anne Frank's diary prior to the start of a Serie A soccer match between Roma and Crotone, at Rome's Olympic Stadium, Wednesday, Oct. 25, 2017. A passage from Anne Frank's diary was read before Wednesday's Italian league matches as part of a number of initiatives to condemn the acts of anti-Semitism earlier this week by Lazio fans and to keep alive memories of the Holocaust. A minute of silence was also observed before each of the Serie A matches kicked off, while Lazio players walked out wearing white T-shirts printed with a photo of Anne Frank and the words "no to anti-Semitism" before their match at Bologna. They also warmed up in the same shirts. Both Lazio and Bologna fans listened to the passage in silence and applauded at the end of the reading. There were about 500 traveling supporters present, although a group of Lazio hard-core fans boycotted the match. 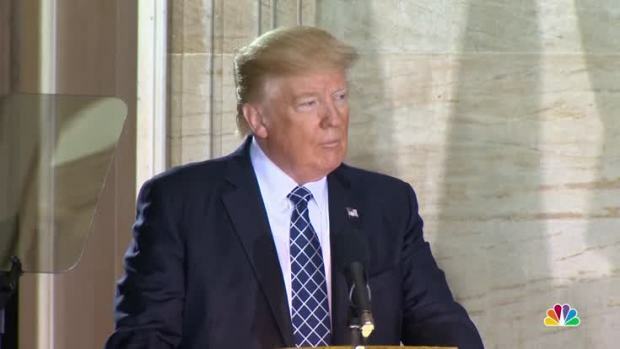 President Donald Trump on Tuesday gave his strongest condemnation of anti-semitism to date, pledging to "stamp out prejudice," "condemn hatred," "bear witness" and "act" against bigotry against Jewish communities and Israel. He spoke on Holocaust Remembrance Day on Capitol Hill. On Sunday, Lazio fans had littered the Stadio Olimpico in Rome with images of Frank — the young diarist who died in the Holocaust — wearing a jersey of city rival Roma. The diary passage read: "I see the world being slowly transformed into a wilderness, I hear the approaching thunder that, one day, will destroy us too, I feel the suffering of millions. And yet, when I look up at the sky, I somehow feel that everything will change for the better, that this cruelty too shall end, that peace and tranquility will return once more." The Italian soccer federation has said the passage will be read aloud at all soccer matches in Italy this week. It said it would also be combined with a minute's silence before Serie A, B and C matches, plus amateur and youth games over the weekend. Copies of Anne Frank's diary, signed by the players, were also given to the mascots at the matches. Israel's sports minister has asked her Italian counterpart to crack down on racism in soccer. Miri Regev's office said a letter dispatched to Luca Lotti called the display "despicable" and accused thousands of Lazio fans of openly identifying with neo-Nazi symbols. She wrote that calling Roma players "Jews" inferred they were a "scourge to be avoided." The Anne Frank House issued a statement on Tuesday. 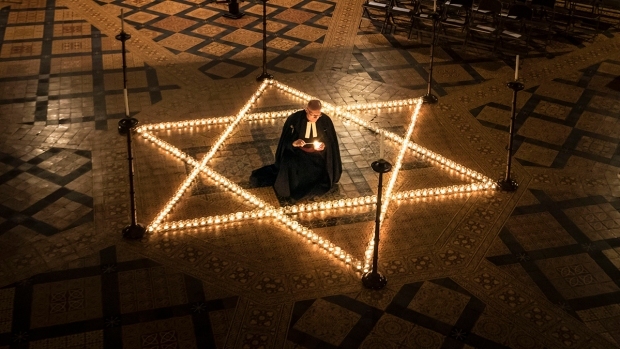 "We are shocked by these anti-Jewish expressions which are extremely painful to those who have experienced the consequences of the persecution of the Jews," it said. Anne Frank became a tragic symbol for all Holocaust victims because of the diary she wrote while in hiding from the Nazis in Amsterdam with her family from 1942-1944. They were betrayed, caught, and deported, and Anne died in a German concentration camp at age 15. Her father, Otto Frank, survived Auschwitz and later published Anne's diary. Six million Jews were systematically murdered by German Nazis and their collaborators in the Holocaust of World War II, wiping out a third of world Jewry.